If you have a love for camping and the outdoors, you will have to go camping Vancouver Island! A beautiful place, Vancouver Island, British Columbia, Canada is one of the most popular camping vacations in North America. If you haven’t heard of it, then welcome to our site and come on in and browse around for quality camping Vancouver Island information and tips on camping in general. There are many campgrounds and outdoor forest recreational areas to choose from. It is one of the best places in the world for camping enthusiasts to play. Vancouver Island is the largest island on the west coast of North America. It stretches 460 kilometers (290 miles) from tip to tip, extends 100 kilometers (62 miles) at its widest point and covers 32,134 km² (12,407 sq miles). The island is part of the Western Cordillera a partially submerged chain and extension of the US Coastal Mountains. Vancouver Island’s west coast boasts some of the worlds deepest and longest fjords in the world. 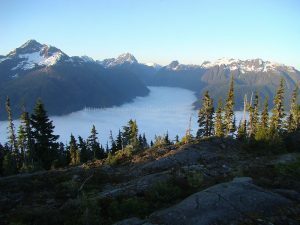 Two of them are Alberni Inlet and Muchalat Inlet which have long river watersheds that flow into them containing many lakes available for camping. These are the Somass River Watershed and Gold River Watershed respectively. The interior forested mountain ranges offer exceptional camping, hiking and outdoor experiences that create memories which will last a lifetime and keep you yearning to return. Some of the more popular mountain peaks which happen to be the highest also are: are Golden Hinde (2200 m), Elkhorn Mountain (2195 m), Mount Colonel Foster (2135 m), Victoria Peak (2163 m), which lies north of Strathcona Park, Mount Albert Edward (2,094), Rambler Peak (2,092), Mount McBride (2,083), and Kings Peak (2,065 m). 6 of the 7 mountain peaks lie within Strathcona Provincial Park and 5 of the 6 are in the 113 km2 (44 sq mi) Elk River Mountain range inside Strathcona Provincial Park. There are hundreds of freshwater lakes with the largest one being Kennedy Lake 37 km (22.99 mi) followed next by Great Central Lake 35km (21.75 mi), Cowichan Lake 30km (18.64 mi), Sproat Lake 25 km (15.53 mi), Buttle Lake 23km (14.29 mi), Nitnat Lake 22km (13.67 mi) and Upper Campbell Lake 21km (13.05 mi). 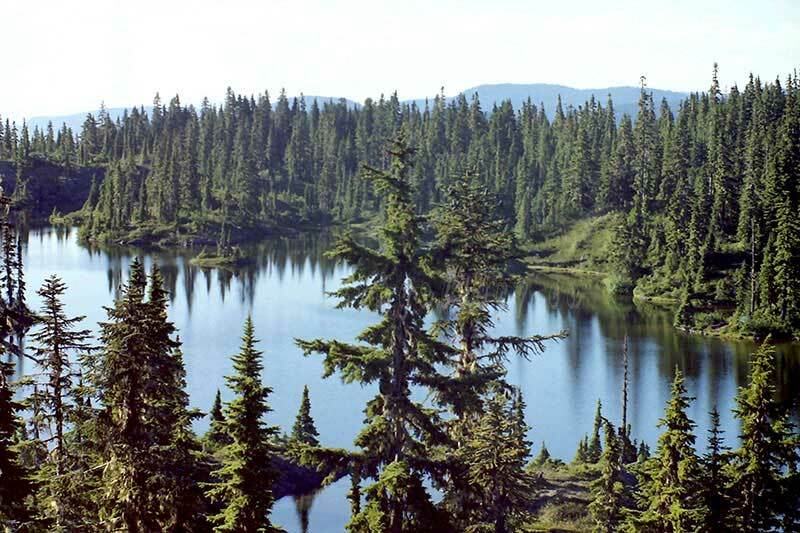 There are many others that fall into the 10 (6.21 mi) to 20 km (12.43 mi) range and numerous lakes under 10 km long. Some of the most popular rivers that flow from the mountainous terrain of the island are: Campbell River, Cowichan River, Gold River, Nanaimo River, Nimpkish River, Nitnat River, Salmon and Somass rivers. The largest watershed on Vancouver Island is the Nimpkish River watershed which extends 118.1 km (73.4 mi) flowing from Mount Alston northwest into Nimpkish Lake and continuing on to the north until it reaches Broughton Strait. Before you begin your camping experience, you will first need to decide what type of outdoor experience you want. 1. Camping Vancouver Island Experience. Before packing up your RV or SUV/4×4, you must decide what type of camping experience you want to have. Are you more comfortable with a traditional outdoor experience that features restrooms, showers, and some of the other comforts of home? Or are you the more primitive type that likes to experience the outdoors the way it is meant to be experienced? Typically, you will find different RV parks and campgrounds that have running water as well as electric hookups in the central and southern region. Whereas, the more primitive camping experience will likely be had on the campgrounds to the west and north. For example, Cape Scott Provincial Park and Pacific Rim National Park Reserve. You can also camp at most of the Provincial Parks on Vancouver Island . Of the 5,833 provincial campsites on Vancouver Island, 2,386 are available without reservations. 2. Pick The Time Of Year. After you have decided on the kind of experience you want to have, you are going to need to pick a time of year that you will visit for camping Vancouver Island. Do you enjoy being with crowds? Or do you prefer to have more isolation and private time? Depending on the time of year, you will have the option for both. The campgrounds on Vancouver Island are generally more crowded and busy during the months in the summer. Some of the more popular campgrounds even sell out at this time of the year. However, the late summer and early spring tend to offer the same amazing experiences without the rush of the large crowds. Most forestry recreation sites are less populated in the earlier times of the season and in the latter half of fall before the winter weather rolls in. 3. Visit The Campsites Or Their Websites. You can either visit the campsites themselves or you can take a look on their website(s). This should give you a good idea on what you can expect from them in terms of amenities. This will allow you to be able to make an informed decision regarding what to bring, what you do not need to bring and how much time to allow for travel to and from the campground of choice. You can even read through our own collection of articles or watch some of our walk through videos of the campground in the article or tip. You should call the campground or forestry recreational site ahead of time and see whether or not they offer reservations. Different campgrounds are going to have different rules regarding reservations. Not every campground on Vancouver Island allow reservations and most of the parks are first-come, first-served. Some of the rules for campsites without reservations may include a limited length of stay to allow for everyone to have a fair chance at experiencing the camping area they have decided upon. 5. Pack Correctly and Enjoy! The last step involves having to pack all of your necessities that you need in order to keep yourself dry and safe. For the basics you should bring a waterproof jacket, long pants, and thermal gear in order to keep your body warm during the cold and long nights. You should however create a list of items that you would like to have and actually need to make your experience a more pleasurable and safe one! You will be able to fine tune this list every time you plan a new adventure based on the things that you wished you had packed during the last one. By following the steps above, you should be ready to have a great time camping Vancouver Island. Get ready to have one of the most incredible experiences of your life!